On Monday morning at about 7:45 I remembered that it was Grey's big "100 Day" party at school and he was supposed to have completed a project where he glued 100 items to a posterboard. We had to leave in 10 minutes and we hadn't done the project yet. I briefly contemplated just keeping him home from school, and then I decided that probably wasn't the best message to send him. SO, I was the mom frantically stapling 100 q-tips to a piece of cardstock in record breaking time while my six-year-old haphazardly called out what number we were on. I was so proud of us for getting it done, even if it was stressful. Then later, when I picked him up from school, I found out the party was actually the following day. I accidentally took a big swig of a latte that had been sitting in the cup holder of my car for several days. Note to self: Clean out car. Yesterday my son spilled bubble solution on the keyboard of my macbook. How he happened to be opening a bottle of bubbles directly over my computer remains a mystery, but there is good news! 1.) I have accident insurance on this sucker, and 2.) My ninja reflexes kicked in and I had it upside down and wiped off in record time. Today it seems to be working fine so I made sure to get that 130-day-overdue backup completed. Whenever I use a public restroom, I mentally plan out what I will do if someone suddenly flings the door open. My heart rate is always up by the time I leave. My friend emailed me to tell me her husband had a bad case of phenomena. I actually spent several minutes googling this strange disease without much luck before I realized that her spell-check had subbed "phenomena" for "pneumonia". I was listening to a book on tape on my phone and it was at an exciting part so I took it to bed to listen for a few more minutes. I don't know how long I was asleep before I woke up and discovered the entire book had played through and started over again. This week I ate a salad and went to yoga class. Then I left yoga class and drove directly to Wendy's. Go me! Okay, your turn! I love it when you guys play along because I get to hear stuff that makes me feel so normal: Such as last week when I learned that one of you anonymous readers valiantly tried to win a vasectomy for your husband at an elementary school auction. That's good stuff. To play, just make your own list of things that either made you laugh or you need to 'fess up. 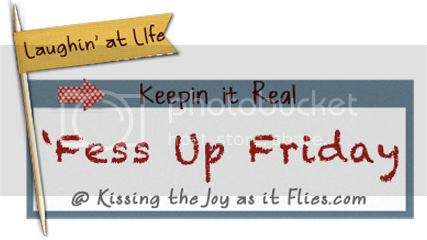 Grab a 'Fess Up Friday button here to put in your post, and then leave me a comment with the link so I can come visit. I know it can be a challenge to remember stuff off the top of your head... it helps to keep a running tab of dorkdom throughout the week. Oh, girl! I have often said that I am on the Sabotage Diet - I start out strong and make some great progress but throw it all away on stuff like a random Cinnabon cinnamon roll. Haha. Also, I cannot tell you how many travel mugs I have thrown away because I cannot bear the thought of cleaning them out. It really sounds like we're a lot a like! I came across your blog yesterday while searching for reviews of Erin Cobb's Clean Color. Then I started looking at your post from yesterday and loved all the projects you posted! So I am back today reading your fess ups...they had me laughing:-) It makes my life with my three little ones seem a little more normal! Anywho...what do you think about Clean Color? Would you recommend it? Hi Melissa! So glad to have you here. To be honest, I'm only halfway through the Clean Color class because I get distracted easily. However, considering how much traffic I have received for just MENTIONING Clean Color on my blog, I will definitely write up a review when I'm done. I'm hoping to finish it this week. So far, so good, but I will have a better idea of if it was worth the money once I finish. I walked in on someone half naked in a public dressing room this week. I really wish they had your ninja reflexes and pre meditated thoughts on what they were going to do if someone walked in on them. All to say, I don't think she ever thought that might happen to her as she just stood there calmly putting on her bra. I was so mortified. Oh my word, Selina, that made me laugh really hard. One time in highschool I was trying on clothes with my friend when a BOY flung open the door on us while we were standing there in our underwear. He was just as mortified as we were because we had accidentally gone into the MEN'S dressing room. I actually remembered some things to fess up this week! By the time Friday rolls around, I can't usually remember what day it is, let alone what happened the day before! 1) I found my five and a half month old baby playing with scissors. I know, I awarded myself the "Worst Mom of the Year" award for that one. But I had him in his Bumbo seat, on the kitchen counter, watching me cook and turned my back for three seconds. When I turned back around, he had SOMEHOW gotten into the basket that was directly behind him and pulled out a pair of scissors- I think my kid has super bending powers or something, because I still can't figure out how he bent all the way backwards and managed to get them out- in the three seconds my back was turned. 2) My first child, Boston, is of the fury variety (with long ears, a short wiggly tail, and a long tongue that likes to give my human baby baths). Boston is a three-year-old cocker spaniel who acts her age in human years, rather than dog years. She has a major obsession for one of my son's toys- a little, blue, plastic hammer. Well, this week, Preston was playing with this particular hammer and Boston stole it straight out of his hands (and mouth) and took off running. I had to threaten her with a burp cloth in order for her to give it back to me. She did this over and over again for a majority of the day and I finally got so used to it that I stopped washing the hammer off. So now I'm all worried that my kid is gonna have dog breath. GrOsS! Heehee! I'm so glad you played along! And don't feel too bad about the scissors... I once caught my toddler in his bedroom with a 12-inch serrated bread knife getting ready to saw a toy in half. I'm thankful their angels are always watching, even when we aren't!